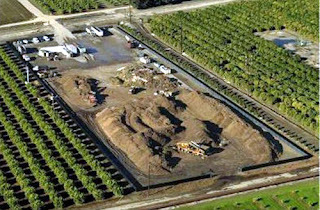 Limoneira Company recently ran an article in its monthly newsletter about how the ag company uses Agromin compost in its orchards. The results of this compost use have been a dramatic reduction in fertilizers, herbicides and water usage. It's truly a sustainable process. Here's the article. In 2004, Limoneira Company created a partnership with Agromin Corporation, a green waste recycler to cities, counties and commercial growers to transform green waste into safe and cost effective compost and mulches for use in agricultural production and community projects. A 10 acre facility on Limoneira property receives over 200 tons a day of this material that would otherwise be transported to landfills. This partnership helps satisfy California AB 939, the Integrated Waste Management Act that mandates our cities and counties to divert 50% of their green waste from landfills. The end-product produced at this facility helps us and other growers to significantly reduce the use of water, herbicides and fertilizers. * Green waste is received from consumers and commercial construction users from the entire Heritage Valley (Santa Paula to Piru). * An average of 200 tons/day processed 5-6 days a week on 12 acres at Limoneira's Orchard Farm facility between Santa Paula and Ventura. Peak in-take July, low January. * 70% (140 tons) is green waste-yard trimmings, grass, etc. and 30% (60 tons) construction materials (wood). * Green waste contains too much nitrogen for optimal agricultural production. The carbon from construction material is needed to optimize this agricultural mixture. * A healthier root system for the trees in Limoneira orchards for more efficient nutrient uptake. A circle of life, inter-dependence, balance and renewal. Everything we hold dear is contained within, dependent upon, and connected to this circle. Soil is the source and destination of all. In today's virtual world, too many of us have lost the ancient awareness of our connection to soil--forgetting that our health, livelihood and well being are all inextricably linked to it. This lost connection to our planet's living skin lies at the root of soil's current global depletion crisis, along with the other imbalances that our biosphere is now showing us. The solution is also a circle ... a circle of responsibility, sustainability, and innovation. Soil sustainability requires a balance between what society demands from soil and nature's capacity to meet that demand. The solution begins with regained awareness. Given the right knowledge and product choices, every individual can make the decision to play a role in returning balance to the circle. Agromin is dedicated to empowering that choice--a dedication that reflects across every aspect of our company. * This mixture shrinks by 30-40% depending upon the moisture content of material and time of year through a meticulous composting process. The material is spread in 6' height "wind-rows" and each row is turned weekly with the addition of moisture for approximately 60 days to aid the composting process. * By maintaining these strict standards, we ensure the elimination of any potential viral infection and weed seeds from the material that would be harmful in the orchards/fields. * Limoneira's orchards are testing bi-annually for nutrient content in the soil. Leaf analysis is also performed. Depending upon specific block needs, approximately 50-200 tons per acre is spread on the fields to enhance growing conditions and fruit quality.